In search of a leaner body or a bigger bench press, no doubt you've dabbled with protein in various forms: shakes, bars, animals. While protein bars, with their higher sugar count, are generally the greatest evil compared to a chicken breast or whey shake, they are the easiest to grab and go. 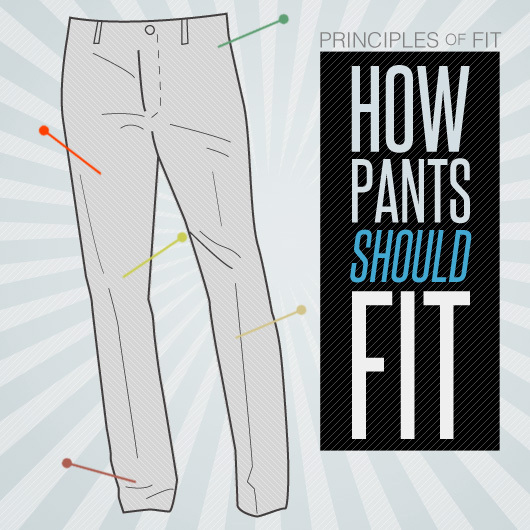 You can toss one in your gym bag, your glove compartment, or laptop bag. Plus, they can sometimes hit the spot when you're craving a candy like substance but don't want to go off the reservation. We sampled four popular brands of protein bars to find the best ones. We judged them on three criteria: taste, texture, and nutrition. Obviously the first two are somewhat subjective but to calculate a nutrition value we looked at how much of the bar was protein and how much was sugar and other carbohydrates. To calculate this number we used a calorie calculation where protein is 4 calories per gram as are carbohydrates, and fats are 9 calories per gram. This gives us an idea of how many calories are coming from each macronutrient, which varies slightly from the weight derived value. Pro: The Clif Bars have a consistently good taste and smell pretty good too. They're chewy and crispy. The S'Mores flavor which we used tasted predominantly of Graham Cracker and the chocolate was fairly subtle. Hints of roasted marshmallow throughout. The Clif bar was 30% protein and 46% carbs derived through calorie calculation, which gives it a pretty good nutrition rating. A solid choice for a protein bar. Con: The bar contains 22g of sugar and 31g of total carbohydrates with 20g of protein. This compares fairly well to most protein bars, but it's not exactly good. Pro: The clear taste winner, the Chocolate Mint Cookie Crunch flavor smelled and tasted exactly like a Girl Scout Thin Mint cookie. It's like a delicious cookie with protein added. It's the smallest bar at only 50 grams, 14 of which are protein. The texture was crispy and crunchy throughout. While offering fewer grams of protein because of it's small size, the ratio of protein to carbohydrates still holds up fairly well. Con: Using the calorie calculation method I found the bar to be 28% protein and 46% carbohydrates, which varies from the advertised 30/40 ratio. Fourteen grams of protein isn't a lot (most of the other bars have at least 20), but this is due to it's small size. 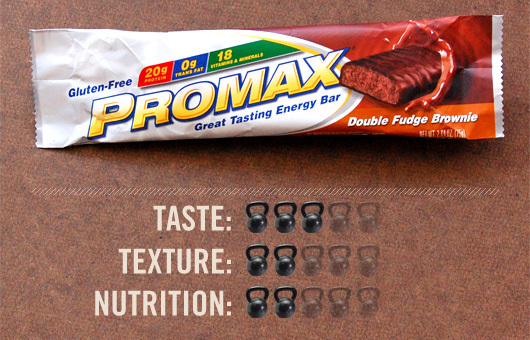 Pro: The bar delivers 20g of protein per serving, is gluten free, and has an alright flavor. Cons: The clear loser, the Promax Double Fudge Brownie was dense, chewy, and slightly chalky. 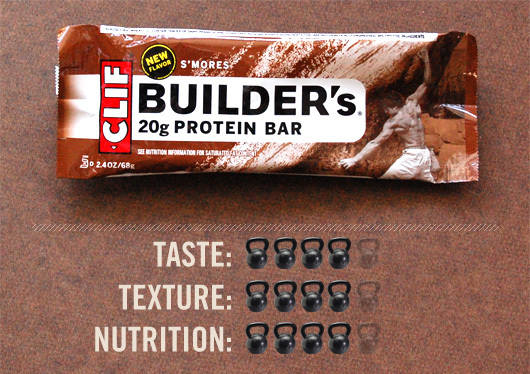 It tastes like how you think a protein bar will taste. In terms of nutrition, the bar was 29% protein and a whopping 53% carbohydrate, the worst ratio of any bar sampled. Pro: This gigantic bar delivered the most protein in the highest concentration, being 31% protein by calorie calculation. It actually out-balances the Balance Bar by having a calculated 40/30/30 ratio of carbs/fats/protein. The texture is layered, with a soft top and a crunchy bottom. The strong chocolate taste was quite good. A great overall value. 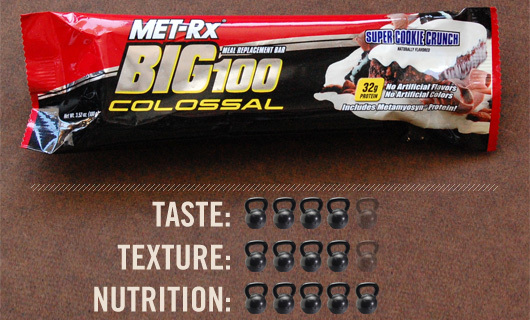 Cons: The bar is huge, perhaps too much to handle in one sitting for many people and delivers a whopping 410 calories. 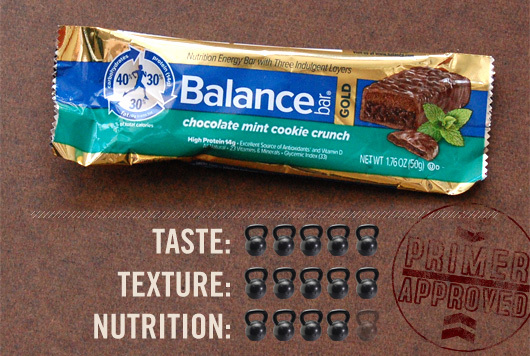 The Chocolate and Mint Clif bars are very good as well and taste very close to a Girl Scout Thin Mint. They are what I buy and I don’t plan on changing anytime soon. Try Metabolic Drive bars from Biotest. Cookie Dough is my favorite, but Chocolate Chunk is a really close second. Best protein bars and the only ones I’ll ever buy. They easily trump your selections, sorry.